The next day was the anniversary of the day Claire and I had met a year previously so we were determined to enjoy ourselves despite the gloomy mood of Sylvia and Oli's unsuccessful attempts to reconcile. We took the front seats, yanked up the music and made for Rotarua. You smell the place long before you see it – it's the most active geothermal region in NZ a big tourist centre. No DOC sites here so we made our way to the well equipped but unfrendly Cosy Cottage Campsite on the lake. We arrived at about 6 and were being picked up at 6.30 to go see a show so we had to pitch tents, shower and make ourselves respectable in double time. The bus driver was called Nuta and was just that, a nutter who kept us all well entertained with quips and jokes as he explained what was to happen on our Maori Village experience. We were formally received by the Iwi (tribe) chief and then a sort of haka was performed before us. The amply tatooed Maori were dressed traditionally and made impressive face gestures, seeming to have much more control over their eyes and tongues than your average Joe. We had definitely rejoined the Kiwi gringo trail – I think I saw 5 buses of tourists in the car park and all were ushered through a stand of trees under which a traditional village had been recreated. 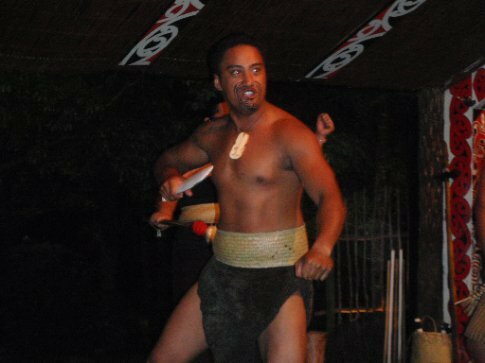 This was followed by a theatrical performance with song and dance in Maori. It was pretty touristy to be fair but entertaining nonetheless. All this was follwed by a hangi, the traditional Maori feast. where the food is cooked over hours while buried underground with superheated volcanic rocks. Delicious but none too healthy I would imagine, certainly if the average build of the Maori chaps and chapesses is to be factored in. On the way back in the bus Nata provided one of the best stand up (or rather sit down – he was driving!) comedian shows I have ever seen. He sang a song from the country of every nationality on the bus – from Canada to Ireland to Australia (which he referred to as the Western Island – brilliant). His comedy even broke Sylvia's gloom and everyone's spirits were much lifted as we alighted the bus.